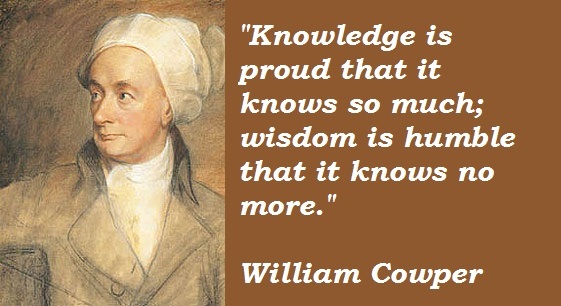 In 1773, English poet and hymn-writer William Cowper experienced a nervous breakdown. He struggled with mental illness and despondency all his life, and now his mind was telling him that he was condemned to hell for all of eternity. In his mental sickness he thought God was telling him to take his own life, so he called a taxi and asked to be taken to the Thames River where he intended to end it all. A thick fog fell about them that evening and the taxi driver drove about lost until he finally stopped to allow Cowper out. When Cowper stepped out of the taxi he found himself standing at his own doorstep. He believed God had sent the fog to spare him. Sometime later he wrote the hymn that contains the phrase so often used by Christians today who seek to understand the ways of God: God moves in a mysterious way His wonders to perform. Ecclesiastes 11:5 — As you do not know the path of the wind, or how the body is formed in a mother’s womb, so you cannot understand the work of God, the Maker of all things. I Corinthians 1:25 — The foolishness of God is wiser than human wisdom, and the weakness of God is stronger than human strength. Proverbs 3:5-6 — Trust in the LORD with all your heart, and do not lean on your own understanding. In all your ways acknowledge him, and he will make straight your paths.